While our children are babies and toddlers, it is relatively easy to have plenty of family time. As children get older, however, their activities start to encroach upon what used to be given family time. You get dance, soccer, piano, baseball, basketball, homework, cub scouts…all of these things that can be enriching and great for your child, and yet take away from the time together as a family. You might also find yourself volunteering or getting involved in activities as your child gets older and easier to take care of, also potentially encroaching on family time. So how exactly do you balance these otherwise good activities and time as a family unit? 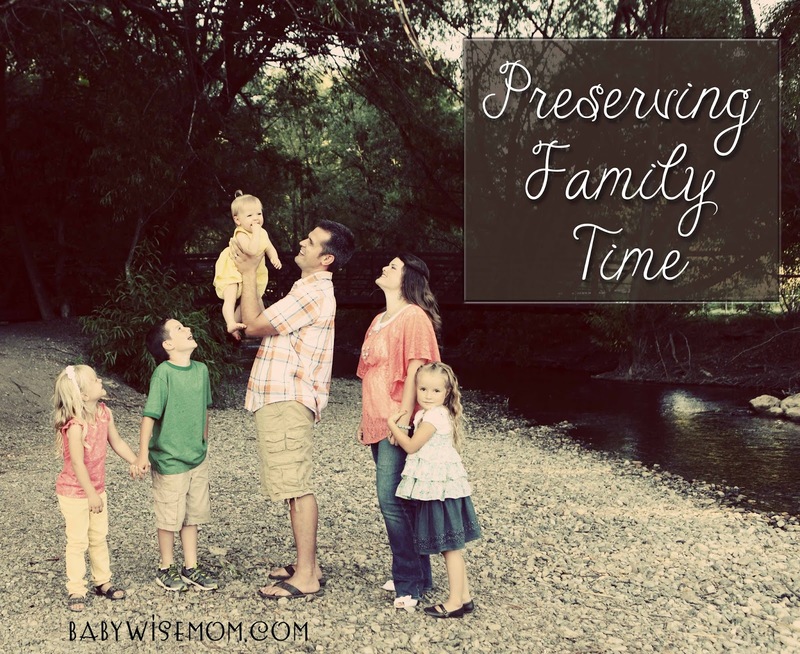 How do you protect your valuable time together as a family from this influx of other things taking your time? I don’t think cutting it all out altogether is the answer–service in the community is great, exercise is great, and learning new skills is great. Family time is also great, however, so we want to preserve it. Here are some ideas for you. First, set clear goals and beliefs for these areas before you are faced with them. What do you and your spouse believe about organized sports for children? Do you see value? If so, at what age do you see it having value? Do you see value in music lessons, and if so, at what age do you think a child should start music lessons? Do this for the various activities and obligations you can foresee encroaching on your family time. Once you know your beliefs and value system in association with these activities, decide how many you think are appropriate at one time. I know one family that has a rule that a person can do one sport and one music activity at a time. Set limitations that will work for your family. Your exact rules will be governed by your own beliefs and goals as well as things like number of children. A family with 2 children might feel able to allow more activities per child than a family with five children. There is no one right answer to these decisions–what is right is what works for your individual family. Do be mindful of over-scheduling your child. I can tell you from experience that these things are much easier to talk about on paper, years removed from the reality of the situation, than it is to put it into action. It is hard to limit activities. There are so many opportunities that sound like great fun: karate, dance lessons, ice hockey, gymnastics, music lessons, tumbling, soccer, baseball, ice skating lessons, swimming lessons, various other sports…and for every activity, you will run into a parent who talks about how much their family loves said activity. You know there is not enough time to do it all, and yet you feel the desire to give your children everything. Just be careful to avoid over-scheduling in your desire to give our child every opportunity in life. This is why it is a good idea to talk about beliefs and goals before you get in the thick of it. If you already are in the thick of it, absolutely talk about it now. The next important step is to schedule family time. Make family time as much a part of your weekly routine as the soccer game. In our family, we set Monday night aside as family time. We do our best to keep this night to just our family–no friends–and just doing things together. We also set Sunday aside as a family day. We don’t play with friends on Sunday–it is a family day. We have fun traditions we do together on these family days together. Things will of course come up. You can reschedule for another night in the week if your night had a conflict. Choose a day you know will have the fewest conflicts on a regular basis as your family night. Another activity we have together regularly is family dinner. We eat dinner together as a family. We sit at the table and talk about our day. As you enter the world of outside activities, it is helpful to stay organized. My husband and I review our planned activities for the week each Sunday after children are in bed. We talk about what we have planned and what we might need to modify. Monday night, we talk about our weekly plan as a family during our family night. My husband and I stay connected through our smart phones and an app called Cozi. It is free. If I update the calendar on my phone, it updates it on his phone. This way, we stay synced. You can also manage your calendar from the internet. Have set times to do things that might potentially interfere with family time. Get your children in the habit of doing homework at a non-conflicting time. Schedule lessons, when possible, at non-conflicting times. You can have a balance of family time and individual pursuits and interests with some simple effort and planning. Hopefully these ideas give you some guidance for you and your family as you face your own activities and family time. You can make it all work with clear goal setting, keeping family time scheduled and in the priority list, staying organized, and supporting each other in your endeavors.